These FAQs are designed to provide a better understanding of our cinemas and products. Use Ctrl+F/Command+F to keyword search. Where is WE Cinemas located? 321 Clementi at 321 Clementi Avenue 3, Singapore 129905. What are the operating hours for WE Cinemas box office? The box office opens at 10am in the morning and the box office ends its operation at the last screening. Please refer to our tickets & showtimes schedule for the last show. Is my WE Club membership still valid? Or how can I sign up? All existing members have had their WE Club membership extended to 31 Dec 2015. We welcome new members and you're welcome to sign up for the club when we reopen in 2015. Do I have to pay for a ticket for my child? If your child is over 90cm in height they are required to purchase a ticket. Other terms and conditions may apply. What does "No Free Passes" or "No Free List" mean? This is a period that has been blocked which does not allow complimentary movie passes to be redeemed. This blocked period usually lasts for about 1-3 weeks (depending on movie) from the date of release, as determined by film distributors. What does "Opening Week" mean? This is a period that is deemed by film distributors and sometimes exhibitor as the beginning period (not necessarily limited to a single week) of the screening of a movie. Tickets are premium and priced slightly higher. This is a special screening of a movie that is made available earlier than the official release date, as determined by film distributors. Tickets are premium and priced slightly higher. “Blockbuster” film is defined by several sets of criteria such as A-List cast and crew, popularity of the film franchise, big-budget production, and similar global release dates of film. WE Cinemas adopts industry standards with such film classification and ticket prices. Tickets are premium and may be priced slightly higher. What is a premium priced film or product? They are FIRST CLASS tickets, Blockbuster films, films that are Opening or are Sneaks, films playing in Dolby Atmos, HFR, 3D. These categories may change from time to time. Tickets are premium and may be priced slightly higher. What are age restrictions and film classifications? There are six ratings in film classification as set out by the Media Development Authority (MDA). They are: • G - General • PG - Parental Guidance • PG13 - Parental Guidance for Children below 13 • NC16 - No Children below 16 years of age • M18 - Mature 18, for persons 18 years and above • R21 - Restricted to persons 21 years and above. Do you have any facilities for wheelchairs? Yes. All our halls are accessible. 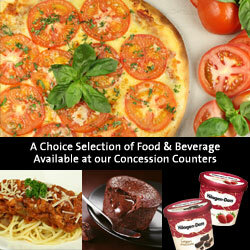 Yes, we have a range of promotions on movie tickets and F&B items for all ages. They are listed on our Promotions page. What are Movie Gift Vouchers (MGV) or Movie Gift Cards (MGC)? Where can I use my 2013 Movie Gift Cards/Vouchers? MGVs are vouchers that can be used to redeem for movie tickets and MGCs are stored value cards which can be used for movie tickets and F&B purchases at WE Cinemas. Simple present your Movie Gift Voucher to a member of staff at our box office and select your movie of choice. Your 2013/2014 Movie Gift Cards and Vouchers have been revalidated to 30 June 2015 and are valid for redemption for movie tickets at our box office. What is the prefix on my Movie Gift Card (MGC)? It's the first five-digits of the set of serial numbers printed on the back of the card. Why is there a PIN number for my Movie Gift Card (MGC)? As an added security measure, all Movie Gift Cards issued in the year 2015 will come with a PIN number. Please note that in order to use your Movie Gift Card to purchase tickets at the counter or online, you will need the use of the PIN number. Loss of the PIN number would render the card invalid. How can I check the balance on my Movie Gift Card (MGC)? 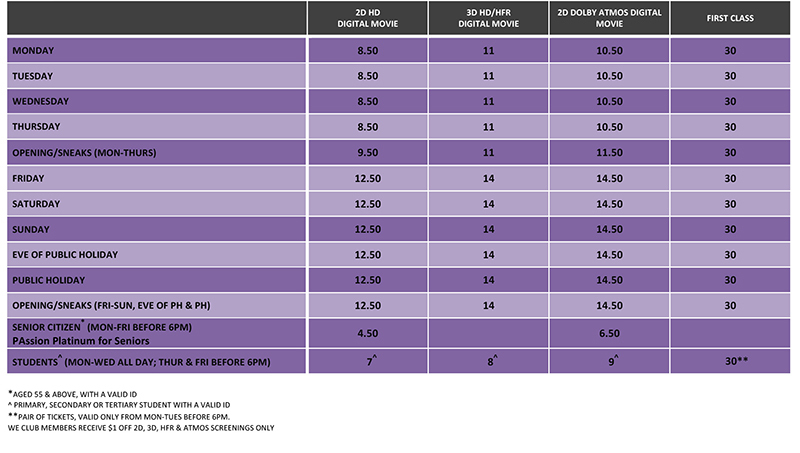 The balance of your MGC can be checked at all WE Cinemas Box Offices by our counter staff. Am I able to hold more than one Movie Gift Card (MGC)? Can I use multiple Movie Gift Cards (MGC) to redeem movie tickets and F&B items? Do I require identification in order to use my Movie Gift Card (MGC)? No. However, you will require the use of a PIN number, which is attached to your card at the point of purchase. May I use my Movie Gift Card (MGC) or Movie Gift Voucher (MGV) for online purchases? No. They are to be used at the Box Office only. What if my Movie Gift Card (MGC) has been lost/damaged or stolen? WE Cinemas will not be able to replace or refund any damaged, stolen, or lost Movie Gift Card. Is there an expiry date for my Movie Gift Card (MGC) or Movie Gift Voucher (MGV)? 12 months from the date of issue, unless otherwise stated. May I personalise my Movie Gift Card (MGC)? You may contact our sales team for assistance at wecinemas@engwah.com.sg. May I use my Movie Gift Card (MGC) for F&B purchases? MGCs are valid for the redemption standard F&B combos (Standard combos; popcorn, nacho, hotdog, family combos only. Not applicable to discounted or promotional combos) only, with the exception of MGCs with prefix 71000 and 81000. May I use my Movie Gift Card (MGC) for promotional items i.e. student & senior concession tickets? (A) MGCs with prefix 70000 and 80000: can be used for the redemption of such tickets. (B) MGCs with all other sets of prefix: are not valid for the redemption of such tickets. Can Movie Gift Cards (MGC) be used for "No Free List" movies? Yes, with the exception of MGCs with prefix 71000 and 81000. Can MGCs be used for 3-D movies? (A) MGCs with prefix 70000 and 80000: can be used for the redemption of 3D movie tickets. (B) MGCs with all other sets of prefix: are not valid for the redemption of 3D movie tickets. Can MGCs be used for HFR/Atmos movies? (A) MGCs with prefix 70000 and 80000: can be used for the redemption of HFR/Atmos movie tickets. (B) MGCs with all other sets of prefix: are not valid for the redemption of HFR/Atmos movie tickets. Can MGCs be used for First Class movies? (A) MGCs with prefix 70000 and 80000: can be used for the redemption of First Class movie tickets. (B) MGCs with all other sets of prefix: are not valid for the redemption of First Class movie tickets. My MGC has expired. Can I get a refund or re-validate them? MGCs have a validity period of 12 months from the date of issue. Any unused or expired value on the MGC cannot be refunded for cash, nor revalidated. I do not have sufficient balance in my MGC. Can I make up the cash difference to redeem for a movie admission ticket or F&B combo? (A) MGCs with prefix 70000 and 80000: The cardholder may use cash to make up the difference to purchase movie ticket or standard F&B combos (Standard combos; popcorn, nacho, hotdog, family combos only. Not applicable to discounted or promotional combos). (B) MGCs with prefix 71000 and 81000: Cash difference not applicable. (C) MGCs with all other sets of prefix: The cardholder may use cash to make up the difference to purchase F&B combo only (Standard combos; popcorn, nacho, hotdog, family combos only. Not applicable to discounted or promotional combos). Can I reload my Movie Gift Card (MGC) with new value? (A) MGCs with prefix 70000 and 80000: MGCs can be reloaded with new value of either $50 or $100. Kindly reload at any WE Cinemas Box Office. Reloads are not immediate, and will take 3-5 business days. Kindly note that the expiration date of the MGC applies to new value reloaded. (B) MGCs with all other sets of prefix: MGCs do not have reload feature. New card designs are constantly available for your purchase. Do check with our Customer Service Staff or www.wecinemas.com.sg for new or upcoming designs. How many Movie Gift Vouchers (MGV) may I redeem over the counter per redemption? A maximum of 20 MGVs can be used per redemption. What is the difference between a Basic member and a WE Club member? As a basic member you can comment on movies, receive newsletters/EDMs from us. As a WE Club member, you can comment on movies, receive newsletters/EDMs, attend exclusive WE Club events, participate in online contests, track your transactions and more (information on WE Club page). A basic membership allows you with preliminary access to the website; users may review and comment on films on our website and receive newsletters on the latest promotions and news. A WE Club member enjoys the full-fledged benefits of being a member of WE Cinemas' movie loyalty program. WE Club members receive discounts on their movie tickets, selected combos, birthday treats and more. How do I sign up as a WE Club member? Application is available online and at the box office. Fill in our online form and complete the registration process with our friendly Customer Service Staff at the counter. You will be issued with your WE Club card and you can begin enjoy rewards & discounts with your purchases. How do I activate my WE Club account? After you have been issued a card at WE Cinemas Box Office, log on to our website and register a free online account to activate your WE Club membership. Is there a minimum age requirement in order to be a WE Club member? No, we believe that no one is ever too young or too old to be rewarded for enjoying movies. WE Cinemas may require WE Club applicants under the age of 21 years to produce such proof of parental consent to his participation in this program or the redemption of rewards as a condition precedent of its obligations hereunder. I have lost my WE Club card. May I apply for a replacement? To get a replacement card, simply make your way to any WE Cinemas box office to complete the WE Club application form. Submit the completed form to our friendly Customer Service Staff (CSS) at the Box Office and a brand new card will be issued to you immediately. An administrative fee of $5 is applicable. What are the terms & conditions of the 1-for-1 Birthday Treat? The birthday treat is valid on all days except Friday & Saturday, midnight sessions and on eve of public holidays and public holidays. The complimentary ticket redeemed must be of the same session as the ticket purchased. It's applicable for box office purchases only. The birthday treat is only valid for use once in the birthday month and is only to be redeemed during the birthday month. Members are required to present their membership card in-person at the box office to enjoy birthday offer. Members may only purchase one ticket at the prevailing usual price to enjoy their second ticket free. This promotion is not valid for "No Free List" films, Atmos, 3D/HFR films, premium priced films, FIRST CLASS, group screenings, film marathons, film festivals, premieres and where otherwise notified. It is not valid with any other promotional offers, student concession discounts, senior citizen's discount, credit card or PAssion card offers. I'm trying to register as a member but I am unable to and I am prompted of a legacy error. A legacy error occurs if you were a former WE Club member. Kindly email us at wecinemas@engwah.com.sg so that we may assist you in reconnecting your membership. I've completed the registration of my online account but I am unable to log in because of an invalid combination. Please check if you have verified your online account via the verification link we have sent to your inbox. Unless you have verified your email via the link, you may not log in to your WE Club account. Tickets can be booked online via the WE Cinemas webpage at www.wecinemas.com.sg. Simply click the 'book' button located below the film you want to watch. Then select the date, time and preferred seats you want. Next enter your payment details into our e-ticketing system to confirm your booking. You will receive email confirming your booking, which includes your Fastix (e-ticket) booking number and ID. You can use your e-ticket at the usher point at WE Cinemas. How do I know my online booking is confirmed? You will receive a confirmation email containing your Fastix (e-ticket), booking number and booking ID. How do I collect my tickets after I've made an online booking? If you have received your Fastix via email, you do not need to collect your tickets at the counter. Otherwise, tickets can be collected from the box office of the respective cinema location you have booked your tickets at. Please provide your booking ID/reference number used to make your online purchase. I have a credit card dispute regarding payment for my purchase. What should I do? Please send us the following details via our Contact Us page and a member of our customer service team will contact you regarding this matter. I did not receive a confirmation for my booking but I've been charged for my booking. What should I do? You may check if the booking went through via the "Online Transaction History" button located in the "Buy Tickets" tab. Enter one of your details in the field to verify if your booking was successful. If your booking has been found, you may print out a screenshot of the transaction history and use it to collect your ticket at the box office. If your booking cannot be found but you have been charged for your booking, please send us the following details via our Contact Us page and a member of our customer service team will contact you regarding this matter. Is there a booking fee for online transactions? Yes, there is a booking fee of $1.50 for all online transactions. This fee covers the administration, development and maintenance required to provide this convenient service to our customers. Why do I need to provide my NRIC? Providing your NRIC provides added security to your online ticket purchase. It is also used to retrieve your online booking when collecting your tickets. I am running late for my film. Will my seat be held? Yes. If you have purchased your ticket online, the designated seat will be held until your arrival and collection of your ticket. Kindly note that there are no refunds nor exchanges for all purchases made online. Fastix is an e-ticket generated with your online purchase. This will be emailed to you as a .pdf file with a QR / bar code which you may print or show at the usher point in order to be admitted into your cinema hall. “Blockbuster” film is defined by several sets of criteria such as A-List cast and crew, popularity of the film franchise, big-budget production, and similar global release dates of film. WE Cinemas adopts industry standards with such film classification and ticket prices. The Dolby Atmos system places speakers along walls, in the ceiling and even behind the screen in order to push sound towards the audience. Up to 64 speakers can be used in a Dolby Atmos cinema, and the idea is to totally envelop the audience in sound for a more immersive experience that places sound elements in a 3D space. With Atmos, it's a sound system that makes you feel like you're in the thick of the action. What is 3D Spectro Silver Screen? This special screen is fitted in all our 3D halls which provides the best clarity, resolution and brightness to audiences. Known in the market as being the best screen for 3D video, Spectro screens are coating-treated with silver aluminum that it offers a very high gain, a very low polarization breakaway, and a wonderful color temperature. What is High Frame Rate (HFR)? Frame rates are the number of images (frames) displayed by a projector in one second. 24 frames per second (fps) is the current standard in cinemas worldwide. HFR 3D productions of 48 fps record and play visuals at twice the current rate meaning less flicker, motion blur and stuttered movement - creating ultra-realistic cinematic experiences. FIRST CLASS is a premium movie and dining experience. Sink into lush, premium seats with a private booth, indulge in a gourmet dining menu and experience attentive concierge service in our luxury movie hall, FIRST CLASS, at WE Cinemas. FIRST CLASS tickets are hall admission tickets. Gourmet dining menu is available for separate purchase. From time to time, FIRST CLASS movie and dining packages may be made available for sale. Do you offer butler service in FIRST CLASS? Yes, be it your meal or convertible blanket cushion, our FIRST CLASS butlers will see to your needs. On top of that, we will be happy to make your experience in FIRST CLASS all the more special with our concierge service where we will offer to make all your special arrangements for you (with 3 days' notice). Please check with our FIRST CLASS butler for more details. Can I organise a private party or group bookings in any of your halls? Yes. You may contact us at wecinemas@engwah.com.sg with regards to organising private parties, events or corporate group bookings in any of our cinema halls, including FIRST CLASS. Why do I need to purchase 3D glasses? For hygiene purposes, 3D glasses are no longer loaned at the cinema. Kindly purchase your 3D glasses either online or at the box office to enjoy your 3D movie at WE Cinemas. These glasses are reusable and you may use them each time you catch a 3D presentation at WE Cinemas. 3D glasses are priced at $2 and come in adult and child sizes. Clip-on 3D glasses are available at $5 and come in one size.